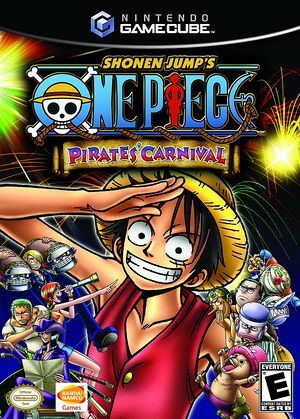 One Piece: Pirates' Carnival (ONE PIECE (ワンピース') パイレーツカーニバル Wan Pīsu Pairētsu Kānibaru) is a party game inspired by the popular One Piece anime. One Piece: Pirates' Carnival comprises over 30 different minigames, which support up to four players, and includes a Reversi-like board game mode in which winning minigames lets you take control of squares and recruit pirates for your ship's crew. The graph below charts the compatibility with One Piece: Pirates' Carnival since Dolphin's 2.0 release, listing revisions only where a compatibility change occurred. This page was last edited on 25 July 2018, at 02:49.